Western lowland gorillas and bonobos (also known as pygmy chimpanzees) inhabit this tropical rainforest-themed setting. In recent years, these highly endangered species have even produced offspring! Bonobos and chimpanzees share 98.7% of their DNA with humans, making them and chimpanzees the closest living relatives to humans. Bonobos are led by the females and tend to share a peaceful society. 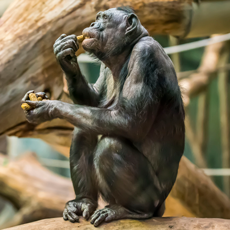 The Milwaukee County Zoo is currently home to the largest group of bonobos in North America. Stearns Family of Apes building.